Scientists at the Hebrew University of Jerusalem have generated an atlas of genes—the essentialome —that are essential for the normal growth and maintenance of human pluripotent stem cells (hPSCs). 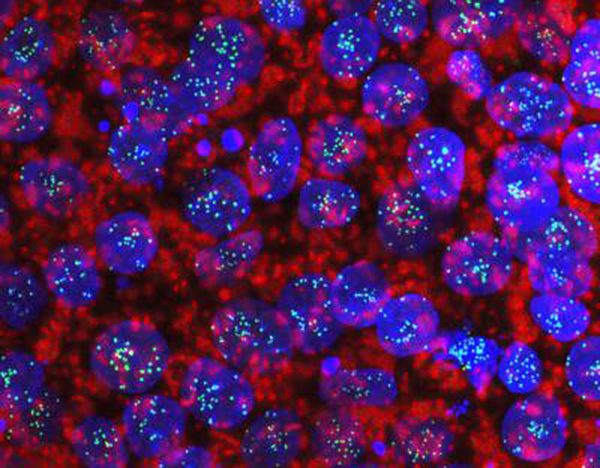 The team, led by Nissim Benvenisty, M.D., Ph.D., director of the Azrieli Center for Stem Cells and Genetic Research and the Herbert Cohn Chair in Cancer Research, carried out a genome-wide CRISPR-Cas9 loss-of-function screen on haploid human embryonic stem cell (hESCs) to highlight which of more than 18,000 genes are necessary for growth and survival of the pluripotent cells and which genes restrict cell growth. “Our screen revealed the essentialome of hPSC-specific genes, and highlighted the main pathways that regulate the growth of these cells,” the researchers write in their published paper in Nature Cell Biology. The findings also uncovered opposing roles for tumor suppressor and oncogenes, evaluated the role of genes for hereditary disorders in early human development and growth, and demonstrated how cancer-causing genes could affect growth of the human embryo. The Hebrew University scientists recently identified a type of haploid hESC that retains human pluripotent stem cell features, gene expression signatures, and epigenetic profiles; can differentiate into haploid somatic cells both in vitro and in vivo; and can be grown and retain a normal haploid karyotype in culture. These features make the cells “an efficient screening platform to address questions regarding pluripotency on a genome-wide level,” the researchers write. Results from the screen suggested that while 9% of all the genes are essential to the growth and survival of these human pluripotent stem cells (hPSCs), 5% act to limit cell growth. Loss of function of these genes gives the hPSCs a growth advantage. “We found that 66% of the cell-essential genes encode proteins that localize to the nucleus, 12% encode mitochondrial proteins and 8.5% encode cytosolic proteins, while the rest encode proteins that are distributed between the endoplasmic reticulum, plasma membrane, extracellular space, cytoskeleton and the Golgi,” the researchers write. Many of the essential genes identified are also mutated in human autosomal recessive (AR) genetic disorders. “Of 2,099 human AR-related genes reported in the Online Mendelian Inheritance in Man (OMIM) database that were also represented in our library, 226 (10.8%) were found to be essential for hESC growth,” the authors note. Genes responsible for AR disorders that have a growth-retardation phenotype were highly represented in the set of essential genes. “Our analysis suggests that the phenotype of growth retardation associated with AR disorders may initiate, in one-fifth of the disorders, at very early stages of embryogenesis,” the researchers continue. These findings open up an exciting future direction toward modeling the growth-retardation phenotype already in hPSCs for a wide group of AR disorders. The team suggests its findings could lay the groundwork for future studies investigating human pluripotency essential genes, hPSC growth regulation, and disease modeling using hPSCs. “This gene atlas enables a new functional view on how we study the human genome and provides a tool that will change the fashion by which we analyze and treat cancer and genetic disorders,”Dr. Benvenisty concludes.